Los Angeles is . . . by Elisa Parhad uses rhyming couplets to travel the city, from the coast to the canyons, LAX to Union Station. 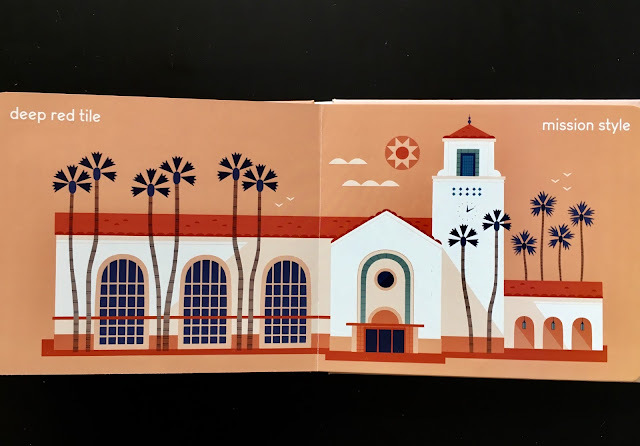 Alexander Vidal, illustrator of the board book So Many Feet brings a chunky illustration style and a muted palette that is warm without being baked by the Southern California sun. I grew up in Los Angeles and spent my first two years of college there and Los Angeles is . . . definitely captures the unique, fun, enchanting aspect of the city, even making a drive into downtown look delightful. I especially love the endpapers of Los Angeles is . . ., which shows the eclectic architecture of the (more upscale, to be sure) neighborhoods of the city, day and night. 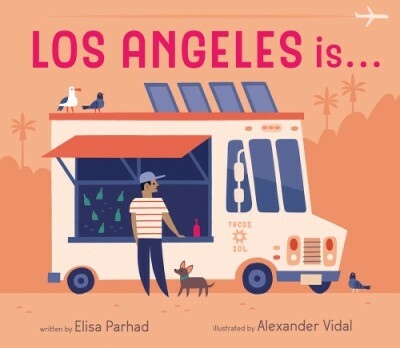 And, for a book with less than 50 words, the author and illustrator do a decent job representing the important contributions that Mexicans and Mexican-Americans have made to the city of Los Angeles and the ways Mexican-Americans continue to shape and influence the character of the city.